Oasis Camel Park07836 734748work Wildlife ParkWe are the only Family Park in the UK with a large herd of both Dromedary and Bactrian Camels as well as their relations the Llamas, Alpacas. We’d love you to get up close to our wonderful friendly Camels and even enjoy a ride on one, terms and conditions apply. But don’t forget we have lots of other animals for you to see and various activities to keep you occupied. Get ‘hands-on’ with our rabbits, guinea pigs in our cuddle-a-pet sessions! Mini maze, play areas, bouncy castle, pedal cars, crazy golf, soft play area plus educational shows and talks all included in the admission price. Save up to £6. £1 off per person up to a maximum of 6 people. Terms & conditions: Valid until 27 October 2019. Not valid in conjunction with any other offer or promotion. Photocopies not accepted. We are the only Family Park in the UK with a large herd of both Dromedary and Bactrian Camels as well as their relations the Llamas, Alpacas. 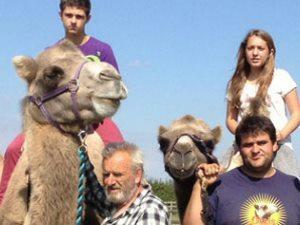 Camel or donkey rides and walk-a-llama available at an extra charge (subject to conditions and availability). Family fun days. Pre booked experience days arranged. Reasonably priced cafe, picnic spots and gift shop. Adults £9, Concessions £8.50, Children £8, Family Ticket £31.50. Follow the B1123 from Harleston towards Halesworth. After approximately 4 miles is the village of Metfield. Go through the village and approximately 1 mile beyond it on a sharp left hand bend, there is a sign to the right for the Jay Gee Dog Sanctuary. Follow this road and we are the first property on the left just after a sharp left hand bend.